This stately custom-built log home captures prominent views of the Grand Teton and Snake River. 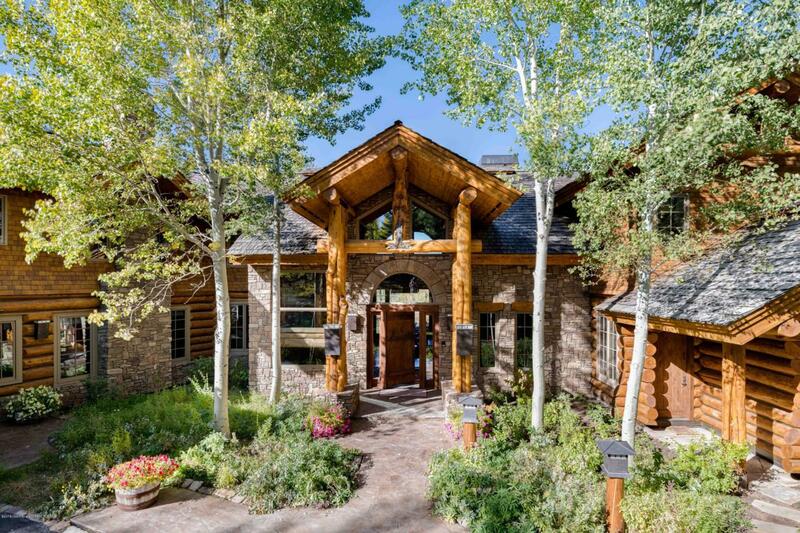 A true mountain retreat, with 5 bedrooms and 5 baths, the two-story log, cedar and stone residence is ideal for accommodating family and guests alike. Encompassing 5,846 square feet of comfortable living space, the cathedral ceilings, floor to ceilings windows with inviting views and oversized wood-burning fireplace welcome you as you enter through the front door. Hickory hardwood floors, exposed log beams and beautiful finishes throughout are a testament to the attention to detail and craftsmanship.The main level of the residence is comprised of the great room, lounge, gourmet kitchen, dining room, wet bar, office (or bedroom) and master suite with a gas fireplace and access to the exceptional back patio including a hot tub, gas grill and TV. The second level of the home features a junior master suite with a luxurious bathroom and two suited guest rooms. All bedrooms and the office, which could be a 5th bedroom have views. The property's idyllic, serene setting is enhanced by the surrounding conservation land. Listing provided courtesy of Graham-Faupel-Mendenhall of Jackson Hole Real Estate Associates, Llc.